Penguins in Africa??? Yes I hear that all the time. On the west coast of South Africa, which is the Atlantic Coast, there are colonies of penguins from South Africa all the way up into Namibia. 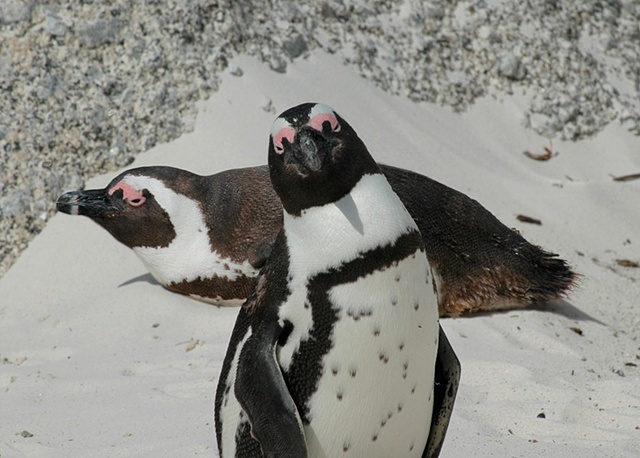 They apparently appeared at Boulders Beach which is south of Capetown in the mid eighties and have never left. These are Jackass Penguins (due to the sound they make) and if you look at their eyes, they have a camouflage eye on their eyelids to make it look as though their eye is open, when in fact in this picture you can see it is almost closed. In my mind I see a cartoon, hence the title.